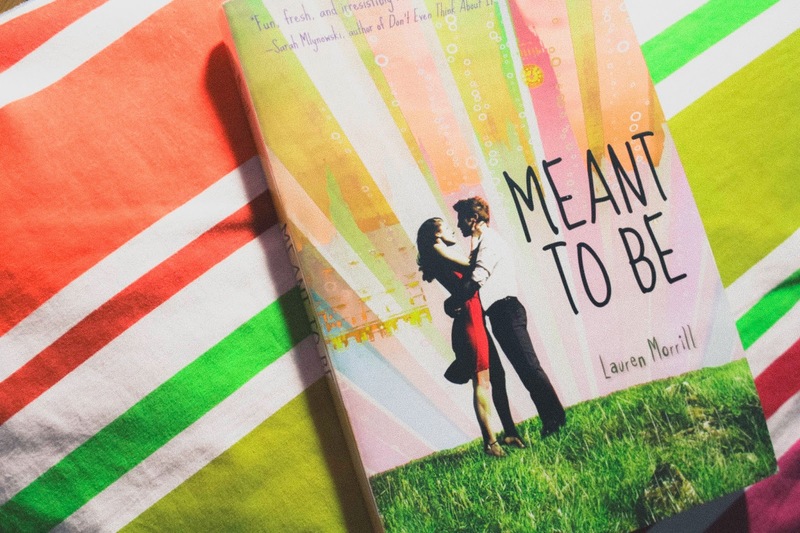 Sab The Book Eater: I was MEANT to Read 'Meant to Be' by Lauren Morrill – and so are YOU! I was MEANT to Read 'Meant to Be' by Lauren Morrill – and so are YOU! The book cover matches my sheets. Coincidence? I think not! MEANT. TO. BE. LOL. Reading slumps are the worst. I was on a slump that stretched for about 2 months when I started reading Meant to Be by Lauren Morrill. I remember being in Fullybooked three weeks ago, January 22nd to be specific, (the receipt is still in the book! ), browsing the young adult contemporary shelves in search of a book that would hopefully help my reading mojo back. Like always, I consult Dianne of Oops! I Read A Book Again via SMS. She may not always be available to reply to my senseless and often random text messages, but I text her just the same. I feel like I just need someone to go all out book nerdy with, you know? So anyway, Dianne and I were texting and I asked her if she had any easy reads (i.e. nothing too intense, feels sprinkled all over) to recommend... SPOILER: if you think she said MEANT TO BE! well, she didn't. Nope. Heehee. She eagerly told me to pick up any Kasie West book. So... yeah. What's the point in telling you this side story? Well... I don't have one actually hahaha but!!! I'd like to think I was meant to read this book (HAHA yeah, I totally found a way to say that) because just when I was able to leave the aisle, Pivot Point by Kasie West in hand, I saw Meant to Be and picked it up as well. I asked Dianne about it, naturally, but I knew I was going to get it no matter what. It's been on my TBR list for so long that I forgot about it already. It's pathetic. Paragraph 1: This girl in school is popular because she looks like a supermodel and I don't, see how plain I look? Paragraph 3: As if that wasn't hard enough, I barely have a social life because I'm busy with competitive sports and READING! I'm a super nerd like that. Paragraph 4: And in case you can't read between the lines – I'm not a rule-breaker. It comes with the whole good girl image. OKAY so it wasn't literally in list form but the way the first chapters were written, it sure did feel like it. I want to get to know characters gradually as the story progresses. I don't want everything set up for me in the beginning because I feel like I have no space for my own judgement. I'm an over thinker like that. However, the more I read, the more I started to enjoy the book. Could this be it? Could I actually be over my reading slump? YES. What I liked about Meant to Be is the overall pacing of the story. I was never bored. I never wanted to skip pages. I was fully consumed in the light and fun love story that Morrill laid out. I love that Jason had an effect on Julia little by little instead of Julia falling in insta-like/love with him. It's a weakness of mine – characters slowly developing feelings for each other before they even realize it. There's lots of push and pull in the beginning – and it'll piss you off sometimes – but they'll get along soon enough! And before you know it... FEELS! It's seriously cute. I promise! In addition to that, Julia and Jason's quest to find the secret admirer included really detailed descriptions of sights around London. Now, I haven't been to London and I didn't bother looking up some of the places, but real or not I love that I could picture the surroundings and feel the sense of adventure. It made it easy for me to fully immerse in the story. And just when I thought Meant to Be couldn't possibly surprise me (because the synopsis will make you think of the obvious ending), well, it did! I couldn't get over how both funny and brilliant the plot twist was in the ending. I don't know if it's my inability to guess major plot twists but I did not see that coming. I had to backtrack a bit and piece everything together! Uhuh. That's right! I beat the reading slump and I have Meant to Be to thank. It helped that the book's light and easy to read so it gave me that momentum that I didn't have for weeks. And it's also a huge plus that it's a genuine feel-good young adult contemporary. It sure put me in a good mood whenever I would sit down and read!